The AALL Executive Board election is quickly approaching, and two candidates’ forums are scheduled in advance of the election. Learn more about the candidates before voting opens on Monday, October 1. Members are encouraged to participate in the moderated forums by submitting questions in advance. To submit a question in advance, email it to candidatesforum@aall.org. When submitting your question, please indicate at which candidate forum(s) you would like the question to be asked. Building upon the success of the “must-have” programs solicited for, and presented at, the 2018 AALL Annual Meeting & Conference in Baltimore, what “must-have” programs should AALL 2019 feature? AALL members have great ideas—share yours through tomorrow, August 17 and see what’s already buzzing among your colleagues. Your ideas will help the Annual Meeting Program Committee identify the must-have program topics for next summer’s conference, which will be included in the Call for Proposals next month. Feeling inspired? 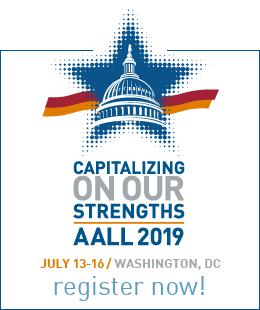 Learn more about the proposal process and turn inspiration into reality at AALL 2019. Libraries collect data on users—from who they are to what they do as they interact with the library and its services—and utilize that data for various purposes. Technology that allows tracking on an entirely new scale heightens concerns about user privacy. Are those concerns universal? Are all libraries affected in the same way? How can librarians think constructively and proactively about best practices regarding what data they collect, what they do with it, and how long they keep it? This webinar will open participants up to ideas of user privacy and organizational priorities to enable them to discover the privacy concerns relevant to their own institution. Managers (including aspiring managers) will have the opportunity to collaborate with colleagues from across the country, learn in a small group setting, and develop techniques that have long-term value and impact. 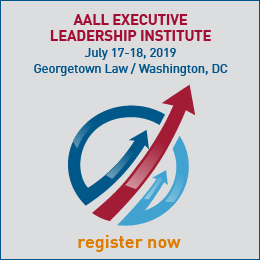 Registration for the 2019 AALL Management Institute will open soon—stay tuned! At last month’s AALL Annual Meeting & Conference, attendees gathered to learn, network, and share knowledge. As an AALL member, you can access the educational session recordings, whether you joined us in Baltimore or not. You can easily listen to sessions from your desktop or on the go—take advantage of this complimentary member benefit, just a few clicks away. Randall Dean, “Email Sanity Expert” and author of Taming the E-mail Beast discusses how to use technology to most effectively promote productivity. This fun and informative 90-minute program features tips on managing your email, your time, managing passwords, Wi-Fi printing, and translation and law reference apps. There is also a discussion surrounding apps that Dean calls “Power Hogs” and ways to manage them. All law librarians know that our days rarely go as planned. Whether it’s a rush research request from a faculty member or an attorney, a database crashing, or an unplanned meeting; a law librarian’s day is constantly interrupted. However, many experts believe that this randomness improves our problem-solving and creative thinking. Instead of pushing against all of the chaos in our profession, we need to embrace it and realize that it can lead us to better results. Researchers also point to different ways to introduce disruption in our decision-making process to bring about improved outcomes. 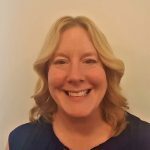 The AALL Executive Board has appointed staff member Paula Davidson, Director of Finance & Administration, to serve as AALL Interim Executive Director beginning October 1. Current Executive Director Kate Hagan’s last day is September 28, and Davidson’s appointment will provide for a smooth transition once a permanent Executive Director is named to lead AALL later this fall. AALL Past President Greg Lambert’s 3 Geeks and a Law Blog was ranked the number one resource blog for legal content by a recent Microsoft/ABA survey (see page 6!). through AALL’s Government Relations materials.